foam used to improve home insulation. Polymer foams are also included in furniture and car seats, and, with the growth of the convenience food industry, they were used increasingly in the manufacture of fast food containers and coffee cups. The gases are released into the atmosphere from leaking refrigeration or air conditioning systems, or sprayed directly from aerosol cans. They also escape during the manufacture of the polymer foams, and are gradually released as the foams age. Halons are widely used in fire extinguishers and fire protection systems for computer centres, industrial control rooms and aircraft. Although they are less abundant in the atmosphere than CFCs, their ability to cause ozone depletion may be 3-10 times greater (Environment Canada 1989). easily soluble in water. In consequence, they remain in the environment relatively unchanged. Over the years, they have gradually accumulated, and diffused into the upper atmosphere. Once they reach the upper atmosphere, however, they encounter conditions under which they are no longer inert—conditions which cause them to break down and release by-products which are immensely destructive to the ozone layer (see Figure 6.5). In 1974, two scientists working in the United States on the photochemistry of the stratosphere, came to the conclusion that CFCs, however inert they may be at the earth's surface, are highly susceptible to break down by the ultraviolet radiation present in the upper atmosphere. Molina and Rowland (1974) recognized that the photochemical degradation of CFCs releases chlorine, which, through catalytic action, has a remarkable ability to destroy ozone. The importance of the chlorine catalytic chain lies in its efficiency; it is six times more efficient catalytically than the NO cycle. The chain is only broken when the Cl or ClO gains a hydrogen atom from the odd hydrogen group, or from a hydrocarbon such as methane (CH4), and is converted into HCl, which diffuses into the lower atmosphere, eventually to be washed out by rain (Hammond and Maugh 1974). Similar conclusions were reached independently at about the same time by other researchers (Crutzen 1974; Cicerone et al. 1974; Wofsy et al. 1975), and, with the knowledge that the use of CFCs had been growing since the late 1950s, the stage seemed set for an increasingly rapid thinning of the earth's ozone shield, followed by a rise in the level of ultraviolet radiation reaching the earth's surface. The world production of CFCs reached 700,000 tonnes in 1973 (Crutzen 1974), after growing at an average rate of about 9 per cent in the 1960s (Molina and Rowland 1974). The total production of CFCs and halons amounted to 1,260,000 tonnes in 1986, before falling to 870,000 tonnes in 1990 (Environment Canada 1992). The effects of such increases in production were exacerbated by the stability of the products, which allowed them to remain in the atmosphere for periods of 40 to 150 years, and measurements in the troposphere in the early 1970s indicated that almost all of the CFCs produced in the previous two decades were still there (Molina and Rowland 1974). This persistence means that, even after a complete ban on the production of CFCs, the effects on the ozone layer might continue to be felt for a further 20 to 30 years and, under certain circumstances, for as long as 200 years after production ceased (Crutzen 1974; Wofsy et al. 1975). The predicted effects of all of this on the ozone layer varied. 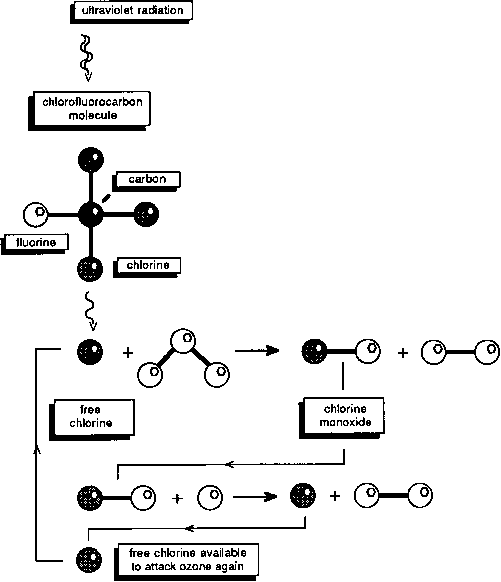 Molina and Rowland (1974) estimated that the destruction of ozone by chlorine was already equivalent to that produced by naturally occurring catalysts. Crutzen (1974) predicted that a doubling of CFC production would cause a corresponding 10 per cent reduction in ozone levels, whereas Wofsy et al. (1975) estimated that, with a growth rate of 10 per cent per year, CFCs could bring about a 20 per cent reduction by the end of the century. All indicated the preliminary nature of their estimates and the inadequacy of the existing knowledge of the photochemistry of the stratosphere, but such cautions were ignored as the topic took on a momentum of its own, and the dire predictions made following the SST studies were repeated. The spectre of thousands of cases of skin cancer linked to a seemingly innocuous product like hairspray or deodorant was sufficiently different that it excited the media and, through them, the general public. Although CFCs were being employed as refrigerants and used in the production of insulation, the problem was usually presented as one in which the convenience of aerosol spray products was being bought at the expense of the global environment. In 1975 there was some justification for this, since, at that time, 72 per cent of CFCs were used as propellants in aerosol spray cans (Webster 1988), and the campaign against that product grew rapidly. The multi-million dollar aerosol industry led by major CFC producers such as DuPont reacted strongly. 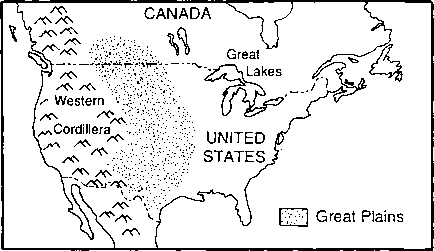 Through advertising and participation in US government hearings, they emphasized the speculative nature of the Molina-Rowland hypothesis, and the lack of hard scientific facts to support it. The level of concern was high, however, and the anti-aerosol forces met with considerable success. Eventually manufacturers were forced to replace CFCs with less hazardous propellants (Dotto and Schiff 1978). A partial ban on CFCs, covering their use in hair and deodorant sprays was introduced in the United States in 1978 and in Canada in 1980. CFC aerosol spray use remained high in Europe where there was no ban. 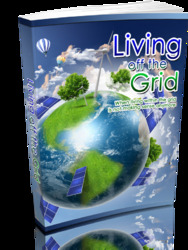 In 1989, however, the European Community agreed to eliminate the production and use of CFCs by the end of the century. The CFC controversy had ceased to make headlines by the late 1970s, and the level of public concern had fallen away. Monitoring of the ozone layer showed little change. Ozone levels were not increasing despite the ban on aerosol sprays, which was only to be expected given the slow rate of decay of the existing CFCs, but the situation did not seem to be worsening. Quite unexpectedly, in 1985, scientists working in the Antarctic announced that they had discovered a 'hole' in the ozone layer, and all of the fears suddenly returned. What 3 countries in 1978 ban on cfc containing aerosol spray? What environmental problem is linked to chlorofluorocarbons in spray cans? What are halons and cfcs used in? What are the environmental issues chlorofluorocarbons?